Wrapped around an empty bottle. 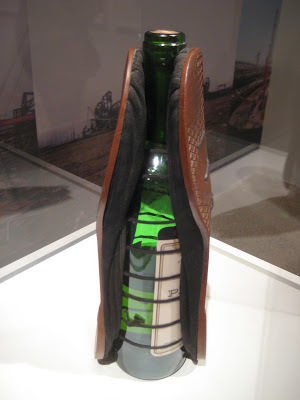 Or did the sole consume the liquor? Or did the soul abuse the liquor? I got my lunch at my usual spot but took it to go, as I wanted to sit out in the sun. As I entered, under the big Yonge/Dundas Square sign, was a man sitting in a chair, alone, with his shades on, smoking a cigarette. Even before I came close, I recognized him. I knew his ex-wife and daughter, his in-laws and many of his friends, as he is from the same town as my mama. I suppose leaving a country you grew up in and coming to Canada isn’t such an easy thing for anyone, but for him it must have been particularly hard because he turned to alcohol…. to escape his thoughts? Reality? Fears? Loneliness? I’m not exactly sure nor do I care to guess. Anyway, I remember hearing from other family years back, that his wife divorced him and that he ended up alone, on the street. I’ve actually seen him randomly before, but today when I saw him I looked to try to see him. He was sitting in that chair, under the big sign, watching the intersection closely, watching people pass him by. It was then that I had a thought – alcohol, and any form of other substance, abuse allows us to become observers of life instead of active participants. I suppose that’s a less painful existence but is it an existence? I’m not sure, I’ve not gone down that route but all I know is that every alcoholic, substance abuser, addict…they all end up alone. They’re simply observing everyone else who is participating in living (living – probably not by the addict’s standards, and perhaps not even by societal standards, but I’d say everyone else who is TRYING to make something out of THIS life); the addicts stay stationed in their chair while everyone else is trying to get places, passing them by. What a way to ‘exit’. What a sad way to die…on the inside. I watched a documentary on Basquiat today. He, like many other artists of his time (and unfortunately even now), used drugs, and drugs killed him. What struck me was him, in all of his glory and fame, questioning the quality of HIS greatness, HIS creativity, HIS talent, HIS work, HIS art, WITHOUT the drugs. It struck me because that is what you would expect an observer of life to question. What wore away at HIS soles – the drugs or the pain he carried around and was unable to deal with? What dissipated HIS soul – the drugs or the pain he chose not to overcome? Substance abuse, of ANY form, hurts and often times kills the abuser. But what the abuser fails to see is that they hurt everyone else around them too. In the case of Basquiat’s story, his ex-girlfriend describes him as becoming violent. He started looking bad. Imagine seeing someone you love slowly degrading BY CHOICE? How could that NOT hurt?! In the case of the person who dreamt of sole less shoes…all I can say is that this person’s light, in their raw-est, most sober state, lifted my spirit, and my soul, to heights it had never been lifted before. Our actions DO affect other people. Substance abuse hurts EVERYONE…especially the children. And they’re left with a permanent scar. You can’t overcome pain by being an observer of life. You have to participate and LIVE IT. If YOU are (or someone YOU know is) dealing with substance abuse, PLEASE get help. Stop hurting those around you and your Self. This entry was posted on Tuesday, August 27th, 2013 at 7:58 pm	and tagged with Ai Weiwei, alcohol abuse, sole less shoes, soulless shoes, substance abuse, substance abuse hurts everyone and posted in Choice, Death, Family, friend, Love, Mindset, One life, Public Talk, Standards, Uncategorized. You can follow any responses to this entry through the RSS 2.0 feed. Thank you T,I’m in tears for many reasons. I am a survivor of a parent who is a substance abuser interchangeable over the years I suspect. Alcohol being the main substance. I agree that pain is the root cause of this horrible choice. The effects it has on loved ones is generational, I fight against it daily for myself and children. I almost lost to it ( the pain,emotional and physical), by almost taking my own life. ( I am not a alcoholic and barly drink, but lately due to greaving I find myselfat times having a drinkand now and then) I face trying to chase this Demond away both for me and my teenage daughter. I’m more worried for her. Thank you for sharing this. this shifted my life in a way that strengthen me and hopefully will be a wake up call for my family. You just validated my post. Thank you. I know that for some who read it, it came off emotionless and lacked empathy but I wrote it like that on purpose – for the addict/substance abuser/the person ‘on the edge’ of walking towards that darkness, to know how it feels for those who love them, to be around them. Substance abusers are often emotionally shut-down, removed, non-empathetic, and very harmful (and often very abusive) to their loved ones’ spirits, emotional (and sometimes physical) health, psyche. IT IS A CHOICE. We can choose LOVE or we can choose darkness. I sincerely hope that you are in a better place now. If you check out my twitter (@tamaranikic), you’ll see a book I just recommended by Bell Hooks. It may be worthwhile checking out. Let me know how you’re doing sometime! All the best and thank you again for reading! I am writing a paper for school and would like to quote a portion of your site but need your approval. Would you let me know if it is all right at mailto:marygreenburg@fulgham.edu”marygreenburg@fulgham.edu. Thank you for your time. Sure! Just send me what you’d like to use and the final product!